The author of the runaway bestseller How the Irish Saved Civilization has done it again. In The Gifts of the Jews Thomas Cahill takes us on another enchanting journey into history, once again recreating a time when the actions of a small band of people had repercussions that are still felt today.The Gifts of the Jews reveals the critical change that made western civilization possible. Within the matrix of ancient religions and philosophies, life was seen as part of an endless cycle of birth and death; time was like a wheel, spinning ceaselessly. Yet somehow, the ancient Jews began to see time differently. For them, time had a beginning and an end; it was a narrative, whose triumphant conclusion would come in the future. From this insight came a new conception of men and women as individuals with unique destinies--a conception that would inform the Declaration of Independence--and our hopeful belief in progress and the sense that tomorrow can be better than today. As Thomas Cahill narrates this momentous shift, he also explains the real significance of such Biblical figures as Abraham and Sarah, Moses and the Pharaoh, Joshua, Isaiah, and Jeremiah.Full of compelling stories, insights and humor, The Gifts of the Jews is an irresistible exploration of history as fascinating and fun as How the Irish Saved Civilization.From the Trade Paperback edition. Lion Publishing Plc, 2006-05-01. Paperback. Used:Good. 1998-02-05. New. Ships with Tracking Number! INTERNATIONAL WORLDWIDE Shipping available. Buy with confidence, excellent customer service! 1998-02-04. Good. Ships with Tracking Number! INTERNATIONAL WORLDWIDE Shipping available. May not contain Access Codes or Supplements. May be ex-library. Shipping & Handling by region. Buy with confidence, excellent customer service! G K Hall & Co, 1998-11-01. Hardcover. Used:Good. 1999-01-06. New. Ships with Tracking Number! INTERNATIONAL WORLDWIDE Shipping available. Buy with confidence, excellent customer service! Nan A. Talese. Used - Very Good. Very Good condition. Very Good dust jacket. 2001-09-01. Good. Ships with Tracking Number! INTERNATIONAL WORLDWIDE Shipping available. May not contain Access Codes or Supplements. May be ex-library. Shipping & Handling by region. Buy with confidence, excellent customer service! 1998-08-07. Good. Ships with Tracking Number! INTERNATIONAL WORLDWIDE Shipping available. May not contain Access Codes or Supplements. May be ex-library. Shipping & Handling by region. Buy with confidence, excellent customer service! Nan A. Talese. Used - Very Good. Very Good condition. Very Good dust jacket. Owner's name on inside. G K Hall & Co. Hardcover. 0783803397 New Condition. . New. 1998-02-05. Good. Ships with Tracking Number! INTERNATIONAL WORLDWIDE Shipping available. May not contain Access Codes or Supplements. May be ex-library. Shipping & Handling by region. Buy with confidence, excellent customer service! 1999-01-06. Good. Ships with Tracking Number! INTERNATIONAL WORLDWIDE Shipping available. May not contain Access Codes or Supplements. May be ex-library. Shipping & Handling by region. Buy with confidence, excellent customer service! Lion Books. Used - Very Good. Ships from the UK. Great condition for a used book! Minimal wear. 100% Money Back Guarantee. Your purchase also supports literacy charities. ANCHOR. New. 8 x 5.28 cm. New York, NY: Nan A Talese-Doubleday, April 1998. 1st US Ed. Hardbound. 8vo. 291 Pgs.. As New in As New DJ/As New. The Gifts of the Jews by Thomas Cahill. Published by Nan A Talese-Doubleday, New York, NY, April 1998. 1st US Edition. Hardbound, Paper DJ. Size 8vo (up to 9-1/2'' tall). Condition: As New in As New DJ. 291 Pgs. ISBN 0385482485. LCCN 97-45139. How a Tribe of Desert Nomads Changed the Way Everyone Thinks and Feels. This book is a road map that opens up the path of Western history, enabling us all to trace our cultural heritage back to its ultimate source - the religious ideas and feelings of ancient Isr'l. Description text copyright 2001 www.BooksForComfort.com. Item ID 3300. G K Hall & Co. Hardcover. 0783803397 Like New Condition. . Fine. Nan A. Talese, 1998-03-16. Hardcover. Like New. IN STOCK - First printing with full number line - not price clipped, clean solid unmarked copy - mailed within 2 working days - expedited shipping availableWe do not ship to all countries. Please contact us about shipping charges before ordering from outside of the U.S.A. Thank you. New York, NY: Anchor Books/Random House, 1999. Text/NEW w/trace margin discoloration. Softcover/NF w/faint crease to lower back corner. First Edition, First Printing. Sequel to Thomas Cahill's (1940 -) ``How the Irish Saved Civilization''; 2nd in his ``Hinges of History'' series on ``the great gift-givers'' who shaped Western civilization. This book is of Jewish contribution. The Bible, of many hands over many ages, is not easy for decipher. Cahill decodes the Hebrew Bible, that is, the Torah (or Teaching), Neviim (or Prophets) and Ketuvim (or Writings). David, he tells us, "He is the captain of the football team, the supersalesman, the engaging entertainer, the charismatic politician". With this contemporary portrait it becomes clear when Abraham in Genesis hears a commanding voice ordering him to ``Go-you-forth/from your land,/from your kindred,/from your father's house,/to the land that I will let you see,'' it was an historical event, literally propelling forth ``a migration in the wrong direction'' that ``would change the face of the earth.'' Indeed, how many of us can today "... get up in the morning or cross the street without being Jewish''? To anti-Semites, he suggests ``The hatred of Christians for Jews may have its ultimate source in hatred of God, a hatred that the hater must carefully keep himself from knowing about.'' Persuasive and thought provoking, Cahill finds ``The Jews gave us the Outside and the Inside ... our outlook and our inner life,'' and concludes. ``We dream Jewish dreams and hope Jewish hopes. Most of our best words, in fact _ new, adventure, surprise; unique, individual, person, vocation; time, history, future; freedom, progress, spirit; faith, hope, justice ... are gifts of the Jews.'' In historiography, Cahill argues the great Jewish contribution lies in the concept of the linear theory, that is to say, humankind progresses and improves in opposition to the cyclical theory. 291 pgs, 7 chapters: I, The Temple in the Moonlight; II, The Journey in the Dark; III, Egypt; IV, Sinai; V, Canaan; VI, Babylon; and, VII, From Then Till Now.. First Edition, First Printing. Soft Cover. NEAR FINE/None as Issued. First Edition, First Printing. Anchor Books/Nan A Talese, 1999-08-17. Paperback. Used:Good. In Stock. Always but with confidence. New York, New York, U.S.A.: Anchor Books, 1999. Soft Cover. Very Good. 8vo - over 7¾" - 9¾" tall. New York: Nan A. Talese / Anchor Books, 1999. FIRST EDITION, first printing (of the paperback edition). Original perfect bound softcover. No previous owner's names, not exlibrary. Overall in EXCELLENT conition.. First Edition. Soft Cover. Fine. 8vo - over 7¾" - 9¾" tall. Paperback. Anchor Books. Religion & Spirituality. New. Hinges of History Brand New: This item is brand new unopened, never used and still in its original manufacturer condition. Doubleday, 1998. Doubleday 1998 1st Printing Fine/ SOFTCOVER. New old stock. Series: Hinges of History #2.. 1st Printing. Paperback. Fine. New York, New York, U.S.A.: Doubleday, 1998. (1st) Slightly smaller book, black spine, cream boards, gilt lettering very bright on spine, dark red with color-illustration from an Egyptian wall inside covers and adjacent end papers, four-line stamp of Unitarian church on top of first front end paper and half-title page, four-line stamp for eminent St. Petersburg Times columnist Bill Maxwell on half-title page also, 291 pages. DJ glossy with color photo of shoreline on front in gilt frame, gilt background to title on spine, praise for Cahill's "How The Irish Saved Civilization" on back for Richard Bernstein in New York Times Book Review, the New Yorker, Thomas Keneally and others. Very Fine DJ/Near Very Fine book.. First Edition. Hard Cover. Fine/Very Fine. Anchor Books/Nan A Talese. PAPERBACK. 0385482493 Special order direct from the distributor . New. Anchor Books/Nan A Talese, 1999-08-17. First Paperback Edition. Paperback. Like New. September 1999 First Edition, w/full number line. Paperback. Clean, tight, bright w/no tears, marks or highlighting. From The Civil War Book Shop- As close as your computer; as dependable as old Abe. New York, NY, U.S.A.: Doubleday Publishing, 1998, 1998. 1st Edition . Hardcover. Dust Jacket Included. 8vo - over 7¾" - 9¾" tall. Very good hard cover edition with very good dust jacket. 1st printing. 291 pages. New York, NY: Doubleday, 1998. Book. Very Good+. Hardcover. Later Printing. Minor wear; otherwise a solid, clean copy with no marking or underlining; a very good reading copy..
New York, New York, U.S.A.: Doubleday, 1998. Very good hardcover, very good dust jacket. First American Edition. Hard Cover. Very Good/Very Good. New York: Nan A. Talese / Doubleday, 1998. 8/1/2011. Fine. Advance reading copy. Uncorrected proof. Fine in pictorial wrappers. The Gifts of the Jews. Nan A. Talese, 1998. Fine in fine dust jacket, in mylar cover. New York, New York, U.S.A.: Doubleday, 1998. (1st, 15th ptg.) Slightly smaller book, dark brown spine, pale yellow boards, bright gilt lettering and logo on spine, dark red background inside covers and adjacent end papers with color-illustration of Egyptian-like pictographs, 291 pages. DJ glossy with photo near lake shore on front, spine and back, praise for Cahill's similar book on the Irish on back from Richard Bernstein in New York Times, Richard Eder in Los Angeles Times Book Review. DJ and book, both Very Fine.. Hard Cover. Fine/Very Fine. Nan A. Talese, 1998-03-16. First American Edition. Hardcover. Like New. Stated First US edition, first printing, full number line. DJ intact and in mint condition. Appears unread, minor shelf and/or handling wear.. Unconditional money back guarantee. Nan A. Talese, 1998-03-16. Hardcover. Used:Good. New York, New York, U.S.A.: Nan A. Talese. Fine in Fine dust jacket. 1998. Hard Cover. 0385482485 . Vol. 2 of the "Hinges of History" (planned 7 total volumes) tells the story of the Jewish people and their contributions to civilization. In dandy condition, crisp and sharp. ; 60178; 8vo - over 7¾" - 9¾" tall . Nan A. Talese, 1998. Hard cover. Fine in very good dust jacket. Near fine jacket shows light scuffing. Clean and unmarked inside with tight binding. Sewn binding. Cloth over boards. With dust jacket. 304 p. Hinges of History, 2. Audience: General/trade. NEW YORK: NAN A. TALESE / DOUBLEDAY. VG IN WRAPS. LIGHTLY WORN. Pages: 291. . 1998. TRADE PAPERBACK.. Condition: VG IN WRAPS. LIGHTLY WORN. Pages: 291. 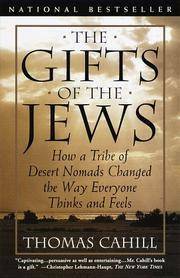 The Gifts of the Jews - How a Tribe of Desert Nomads Changed the Way Everyone Thinks and Feels. Doubleday, New York 1999. Pb. New. Anchor Books/Nan A Talese. PAPERBACK. 0385482493 *BRAND NEW* Ships Same Day or Next! . New. Anchor Books/Nan A Talese. PAPERBACK. 0385482493 *LIKE NEW* Ships Same Day or Next! . Fine.